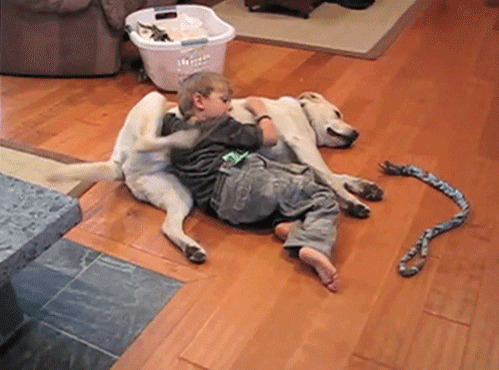 Just a cute picture picture of a dog and a kid, right? Absolutely, animated and all. But check out the file name extension: *.jpg. An animated JPEG? Google that and you’ll find lots of seemingly authoritative statements that such a thing isn’t possible. Download it and it displays in Windows picture viewer as animated, although the speed is quite a bit slower. This entry was posted in Codecs, Computer. Bookmark the permalink. 3 Responses to Animated JPEG? I found one of these a few months ago and did the research to figure out how it was done. Indeed it is true that it is impossible to animate a JPEG file. So how is this done? It is really quite simple. This file is actually an animated GIF file and someone simply renamed it to a JPG extension. So it is not a JPEG file after all. Don’t believe me? Open the file with a text editor such as Wordpad and you will see GIF89 as the first 5 bytes of the file. Windows uses this rather than the extension of the file to know how to decode the file. Pretty tricky, huh? You can rename the extension to any photo file format recognized by Windows and it will still work. Try renaming it to .TIF and display it in the Windows viewer and sure enough it is still animated. Ever hear of an animated TIF file? I notice that when I save the image it is saved as a .gif – could it be just a mistake in tagging? Carl, thanks for that. Tricky. Yes, if I change the extension to .gif it works fine. Mark, it didn’t change extension when I saved it. I’m still on Windows XP on this computer so perhaps there’s more robust file checking and correcting in later versions.